Victory VX100 The Super Kraken Amplifier Revealed! Victory Amplification has announced VX100 The Super Kraken! This 100-watt, dual-channel, three-mode all-valve amp VX100 is an evolution of Victory's VX The Kraken, developed with Dorje/Toska guitarist, Rabea Massaad. New features include a footswitchable clean mode and a footswitchable Preamp Focus function to add a little juice and cut to any and all modes. Additionally, you'll get a preset Bass Focus option in the power section, footswitchable FX loop, assignable/footswitchable dual masters, full MIDI switching capability, and a useful 30-watt low-power mode. Get in contact with us to pre-order yours today! NAMM 2018: New Victory Amps - VX100 Super Kraken, MK II and All-Valve Preamp Pedals! Winter NAMM2018 Coverage: To say the Victory booth was buzzing would be an understatement! We're excited to share the latest releases including the VX100 Super Kraken, V30 Goddess MK II and a first look at the new All-Valve Preamp Pedals due in stock at The Music Zoo this year! Victory Amplifiers Announces the Richie Kotzen Signature RK50 Head & Combo! Coming To The Zoo! 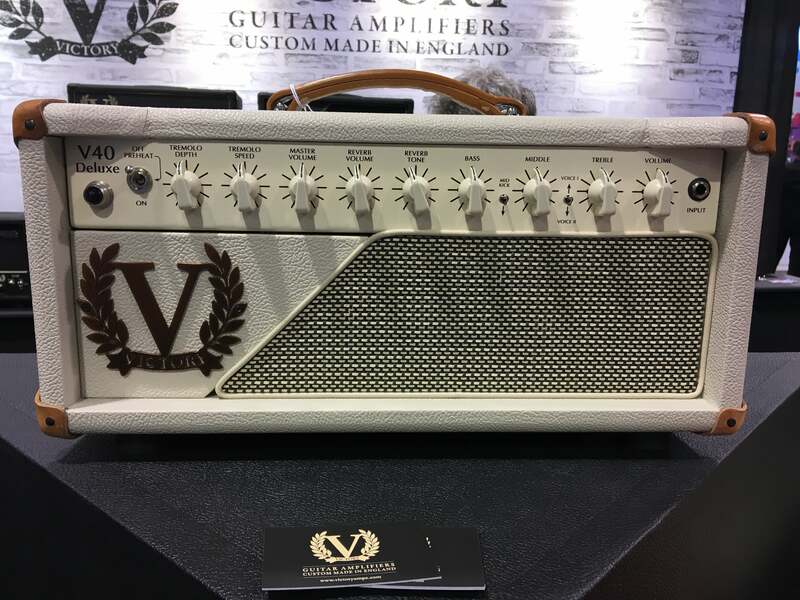 Victory V130 The Super Countess Amplifier! NAMM 2017 We love Victory Amplification. Many of their amps are small models that can fit into an overhead bin of an airplane and have more punch and tone than some of their full-sized contemporaries. Now for NAMM 2017 they have introduced two new models to the fleet. Take a look below! Video – Dennis DelGaudio Demos EVH And Victory Lunchbox Amps! Watch as Dennis DelGaudio of Shotgun Wedding gives a rundown of our favorite lunchbox amps, including the EVH 5150, Victory The Kraken, and Victory RD1! We dig all three of them, but we’ll let you watch the demo and judge for yourself! View our entire stock of EVH Amplifiers! View our entire stock of Victory Amplifiers! Hear more from Dennis DelGaudio and his band Shotgun Wedding here!